Seems they find this fire what they call suspect whatever that means. 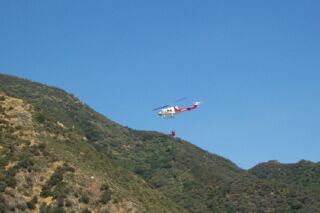 It was very interesting to go up and watch the helicopters dropping water. It seems like they are dropping a thimble full of water and it would never amount to anything. 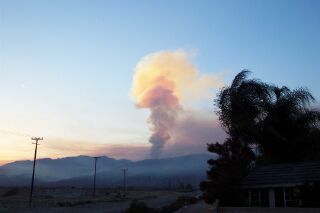 Then there were larger planes that would fly overhead and drop orange fire retardant. They would use this to try to build up a line the fire would not cross. They had it out in about 2 days. There was quite a bit of forest that burned out. 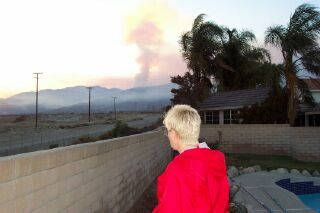 While it was only a few miles from the house it couldn't move down though the all the housing and concrete and we were never in any danger. If you look close you can actually see flames in there. Don't get to close though you might get burned... 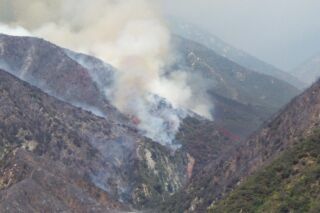 The flames would flare up every so often as a new bunch of trees caught fire. And finally a shot of the damage. I don't have a shot up the canyon but this goes up quite a ways. 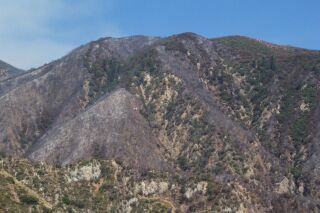 All the gray areas had trees before the fires.